There are many travel games for children of all ages available. Many require some toys and equipments but some require only your imagination. We will explain 10 car travel games that do not need any toys or equipments - many of them, with little or no adjustment, are also excellent games when flying with children. At the end of this article, you will find a Download button. Just click the button, printable travel games, and take them with you on your journey. Before you leave for your car journey prepare an age appropriate treasure hunt list for your child. On the list should be items that you are likely to see on your journey and you child needs to mark off each item they see. Depending on your journey, your list might include items like church, school, bus, telephone box, horse, sheep, cow, dog, statue, lake, playground, gas station, supermarket, police officer, etc. You can easily create a list like this if you have a word processing application like Microsoft Word. By using the Clip Art function, you can search for items and insert a picture of the item into the sheet, which is useful if the child has not started to read. One player thinks of something, it can be a person or a place - it can even be an animal or a thing... and asks the other players “Who Am I”. The other players can then ask set number of questions, usually 20 questions... so the games doesn't drag out too long. The questions aim is to find the person identity and could include questions like: Are you a man or women, are you famous, are you an actor, etc. The person answering can only answer with “yes” or “no”, though you might want to allow full answers when playing with the youngest kids. Travel games for children that encourage their imagination are always great car travel games but they are usually also great airplane games for kids as well. First player starts with a sentence, then player 2 adds a sentence and so the story evolves. The outcome can be a truly awesome story... that no one could have thought up on his or her own! I Spy is a classic travel games for children and probably one of the first fun car game you will teach your child. There is more than one way of playing this game. With younger children you might use colors. You would then start the game by saying “I spy with my little eye, something that is ...” and fill in with a color. The child is then required to guess what it is you are looking at. Travelling with kids is always fun, no matter what age they are. Top Travel Tips offer Family Travel Tips for children of all ages. With older children, you might use the alphabet and then you say “I spy with my little eye, something that starts with...” and fill in with a letter. When the child guesses the right object then it is the child's turn to “spy” something. You continue to take turns until you run out of ideas. If either one of you cannot guess the right object then the person doing the “spying” will get another turn and spy a new object. Sing along and you will be there before you know it. Singing together is a great way to pass the time on a long car journey. It is a good idea to keep a songbook in the car at all times, they will give you song ideas and help you with the lyrics. Young children love songs with repetition but to make it even more fun, try throwing in few lines of your own. Young children love singing silly songs. They also like active songs, so song like “Head and shoulders, knees and toes” and “If you're happy and you know it clap your hands” should be popular. With older children, you could sing a round, i.e. the first person starts singing, when she has done two lines the next person joins in singing from the beginning of the song too. It continues like that, each person singing the song from the beginning to the end. This is quite challenging so makes great travel games for children. 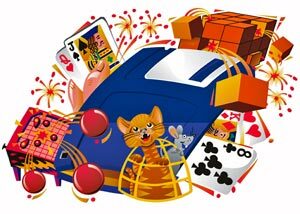 Counting games are easy and fun car travel games for children that can easily be adjusted to fit any age. First, decide on a destination where players will stop counting. Then decide what you are counting. Family cruises are getting increasingly popular, we assist you with how to Choose Your Family Cruise Vacation. There must be two players or teams as each is allocated a side of the car, i.e. left or right side. The winner is the team that has counted the highest number when agreed destination has been reached. You can count number of yellow cars you pass, phone boxes, cows, dogs, bicycles, etc. To make the game more interesting you can agree before hand on distractions. Like if you pass a graveyard on your side of the car you go back to zero... but only if the other team calls out that they have spotted the graveyard. You goal would be to distract the other team so they will not notice it in time. You can also offer bonus points for some rare sightings (depending on where you are driving), i.e. you might get extra ten bonus points if you spot a black cat or white horse. Adults might want to help keeping the scores to make sure everyone is happy at the end of the game. The first player starts with “I'm going on a vacation and I'm going to bring...” and names the item she is bringing. Let's say she is bringing her backpack. Then the next person says “I'm going on a vacation and I'm going to bring a backpack and...” and names the item she is bringing but that item must start with the last letter of the previous item, which is k in this case. So this person might want to bring her kitten with her. Your family is likely to be what you value most in life and your family safety therefore your top priority when travelling. Don't leave it until last minute to sort out your Family Travel Insurance. It continues like that, the players take turn until someone forgets an object. That person then leaves the game and the game continues until only the winner is left. It can be a good idea to let the adult in the passenger seat act as a referee and keep track of all the items on the list. You can also simplify this game by taking out the memory element. Then each child will not have to repeat the items on the list, only come up with a new item that starts with the last letter of the previous item. These are of course fun airplane games for kids as well. This is an excellent game for two players. The first person asks the other person question like “What did you do with the money I gave you yesterday”. The other person can answer whatever she likes as long as she doesn't say “yes, no, black or white”. What color was your hat? Did you wear it yesterday? These are ideal travel games for children starting to learn geography. The first player names a country, like Spain. The next person must name a country which name begins with the last letter of the previously named country, which is N in this case so it could be Nepal or Namibia. So it continues until someone gives up. You can easily adjust this game to fit various subjects, like animals, films, pop stars, etc. This game also works as airplane games for kids. This is a cheeky one... but after playing all the others travel games for children, you might like this one. See who can stay quiet for the longest period. The last person to make a noise wins and gets a treat. Sit back and enjoy the silence... while it lasts. You can print these travel games for children and take them with you on your next journey. Just click on the button below and you can download and print them in proper format. Have safe and fun journey.